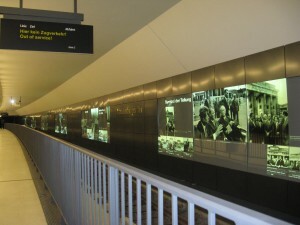 The new U-bahn station at Brandenburger Tor on Line U55. So…a friend of mine, D, proposed this crazy idea at the beginning of the year. He wanted to ride all of the U- and S-bahn lines in Berlin. He had wanted to do this in Boston when he was an undergrad there, but didn’t get around to it. The next best thing? Berlin. The only problem is that there are 305 stops altogether. Yikes…how do we conquer that? There were two others involved whose aliases are L and V (V’s name starts with an “I” but after re-reading this post, a friend and I realized it was just too confusing). The four of us set a date and decided to plan our mode of attack the evening before. V, D and me in front of the Olympic Stadium built for the 1936 Olympics. Olympiastadion is the western end station of the U2. The planning consisted of figuring out which connections were most efficient based on the time tables (frequency of trains coming to specific stops). D had memorized the entire U- and S-bahn system (as in all the stops and which respective lines they were on) in preparation for our crazy adventure. We set a time limit: 24 hours. My requests? Bathroom breaks and snacks. The others readily agreed. We all met at Alexanderplatz at 6:11 AM on a Saturday morning (I know, I know…we’re ridiculous). We took the 6:21 U5 train to its other end station, Hönow. We all had our own reservations about riding the entire U- and S-bahn network with three other people for the entire day. Would we tire of each other? Surprisingly enough, we held various conversations the entire day and had a wonderful time together. Long story short: We did not manage to conquer the entire network. However, we’ve proven that it CAN be done. We unfortunately missed 6 S-bahn lines. We came to the conclusion that if we were to attempt it again, we would take on the S-bahn lines before the U-bahn lines as the S-bahn lines run infrequently after a certain time. So, how many stops did we, in fact, conquer? V left early due to feeling ill three-quarters of the way through, and D and I parted ways with L late into the night. D labeled all the stops we were at and in which order. He came up with this number for him and me: 246. That’s right. D and I conquered 246 stops out of 305 in a 22-and-a-half-hour period. “Jill I want”. (or “I want Jill”. It rhymes in German.) 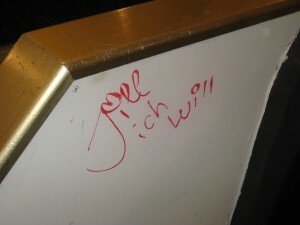 The others found this on a random bench at the end station, Rathaus Spandau, on the U7 line. 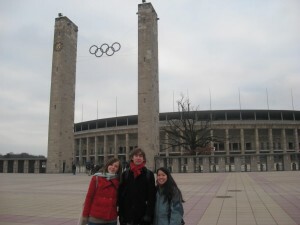 This entry was posted in Jill Nguyen '10, Fulbright to Germany and tagged A Real Adventure, Public Transportation. Bookmark the permalink.